David Stockman: A Messaging Tip For The Donald: It’s The Fed, Stupid! Au contraire! Those propositions are the most economically destructive and wantonly unjust notions ever embraced by an agency of the state. They clobber the middle- and lower-end of the income ladder while showering the top tier of financial asset owners with stupendous windfalls of unearned gain. So the nation’s rogue central bank is essentially a reverse Robin Hood on steroids. If Donald Trump wants to hit the ball out of the park next Monday evening, therefore, he needs to quickly skip over his dog-eared income tax cut plan and put the wood good and hard to the Fed, Janet Yellen, and our unelected financial rulers. They are killing wages, off-shoring jobs, trashing savers, subsidizing the banks, gifting Wall Street speculators with endless financial bubbles and rigging the markets to insure that the Democrats win. In response to that line of attack, Hillary will harrumph and sputter about the sacred “independence” of the Fed; claim that by slashing interest rates the Fed “saved” the American economy; and scold that such reckless talk will unsettle markets. But none of that will even register with the hurting voters of Flyover America. They know the Fed serves Wall Street and the moneyed classes and that rigged financial markets have done nothing to arrest their shrinking living standards and diminishing job prospects. 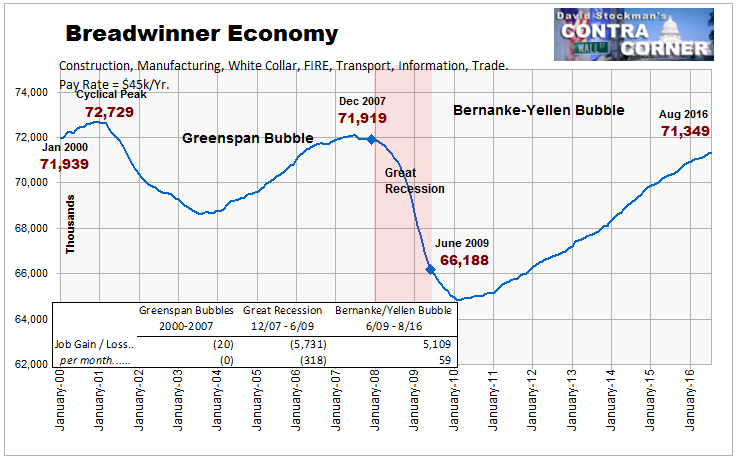 Unfortunately, what will register loudly with so-called Reagan democrats and other working people is the chart below. If Trump keeps listening to his semi-geriatric economic advisors, who are stuck in a 1980s time warp, he will spend the night answering Hillary’s irrefutable accusation that the Trump tax plan amounts to a 1.3% cut for the middle class and 16% cut for the top one percent. No, we are not channeling Paul Krugman or Professor Piketty. In principle, lower income taxes are better than higher taxes and deliberate redistributionism by the state is always doubly bad. But the villain of the piece in 2016 is not the IRS tables; its the central bank’s printing press. So there is no point in taking a political hit to solve the wrong problem. It was a totally different world in the early 1980s. The Gipper’s promise to slash incomes taxes by 30% across-the- board resonated with “Reagan democrats” because double-digit inflation was causing a rip-roaring bracket creep. Wage and salary workers were getting nailed with unlegislated tax increases, and that weren’t going to take it anymore. Indeed, without the tax rate cuts, the Federal revenue take would have risen from 19.5% of GDP under Carter’s last budget to 24% of GDP by 1986. By contrast, the Federal income tax is now indexed and has been for 30 years. Tax brackets, the standard deduction and personal exemptions are all shielded from inflation by law. So when Steven Moore and his Club for Growth high rollers start jawing about income tax cuts, no one in Flyover America hears them. Instead, what they hear is “Hillbama” demagogueing about the wealth inequality that their minions at the Fed have actually caused; and the prospective 12:1distributional benefits from the proposed Trump tax cut that go to the 1%—who could readily do without it in the name of the more urgent tax cuts described below. Indeed, after three decades of indexing and GOP tax-cutting the ranks of wage and salary workers in Flyover America hardly know from income taxes. In the most recent year, the bottom 75% of tax filers—–and that’s about 104 million citizens—–paid only 14% of the income taxes. Moreover, a goodly portion of that huge number paid no Federal income tax at all. Overall, these 104 million tax filers posted $2.8 trillion of adjusted gross income (AGI) but paid only $169 billion in Federal income taxes. That’s just 5.9%. And as the man on late night TV used to say, there’s even more. The bottom50% of tax filers—–the 69.2 million filers who are really getting monkey-hammered by the crooked regime of the Wall Street/Washington ruling elites—- paid only $34 billion in Federal income taxes. That’s an average of $9 per week or 3.2% of the group’s $1.03 trillion of AGI. So Donald Trump needs to stop visiting the Supply-Siders Nursing Home and get with the current facts of life. To wit, the top 10% of tax filers—–just under 14 million—pay 70% of the income taxes, and will get upwards of 85% of the benefits from the Trump tax cut announced last Thursday. Here’s the thing. Well more than half of this tiny slice of the electorate will vote for him anyway because they live in Houston, Indianapolis etc. And the rest live in the precincts of the bicoastal elites, where they get their news from the New York Times and will thank him for the extra cash by voting for Hillary, anyway. By contrast, there are 160 million payroll tax-payers in America. And they are getting hit with the ol’ doubly whammy. That is, due to the Fed’s disastrous 2% inflation targeting policy, the bottom 130 million are losing jobs to China and the off-shore markets and purchasing power to domestic inflation. At the same time, they are paying through the nose on account of a nearly 16% payroll tax levy. To wit, the average wage earner at $22 per hour gets$3,000 extracted from his/her pay envelope, even as their employer is whacked for another $3,000. On the margin, that $6,000 wedge kills jobs and shrinks real household incomes. Yet there is a Trumpian solution that makes far more sense under today’s conditions than the tired old supply siders income tax cut for the 10%; and most especially the top 1%—- who pay 14X more in income taxes than the bottom 50%, and who would capture upwards of 45% of the Trump income tax cut. To wit, eliminate the payroll tax entirely and replace it with a tax on imports and business sales (otherwise known as consumption). That was proposed by Lyin’ Ted in the primaries, and at least that part of it he got right. Yes, and for political protection from the social security calamity-howlers, he could revive Al Gore’s “lock box” and dedicate every penny to funding social security—especially for the 90% of recipients who actually need it. That gets us back to the Fed and it’s malefic 2% inflation targeting. In an open global labor market, high paying jobs in finance, government, entertainment, the professions and business management get off-shored last, but are also the first to inflate at or higher than the general CPI rate. By contrast, it is lower tier jobs that get off-shored in response to the China Price for goods and the India Price for services. That is, the average nominal hourly wage in the US has nearly tripled since 1987, but all that “inflation” was for naught. 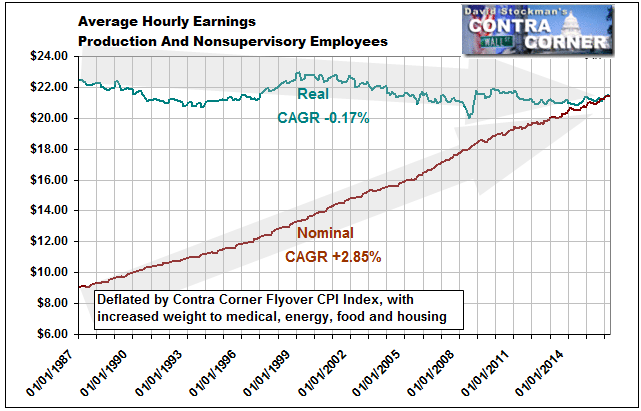 Real wages went nowhere even as soaring nominal labor expense caused good jobs to be off-shored in droves. It should not be surprising, therefore, that there are no more full-time, full-pay breadwinner jobs at $50k per year in the US today than there were when Bill Clinton was packing his bags to shuffle out of the oval office in January 2001. On the margin, any goods and services jobs that can be off-shored, have been sent abroad. Indeed, in the context of the highest nominal wage rates on the planet, a central bank not enthrall to Keynesian voodoo would actually welcome deflation, not print money until the cows come home trying to stimulate inflation, thereby deliberately making war on wage earners who must compete in the world labor market. And it’s also not surprising that what has been created in the labor market since the year 2000 are jobs which so far can’t be off-shored. That is to say, bartenders, waitresses, hot-dog vendors, retail floor sales clerks and temp agency gigs which fill the cracks and come and go with the business cycle. Unfortunately, that category of employment averages just 27 hours per week, $14 per hour, and $20k on a full year basis for holders who are lucky enough to be paid 52 weeks per year by computerized demand-load driven scheduling systems. 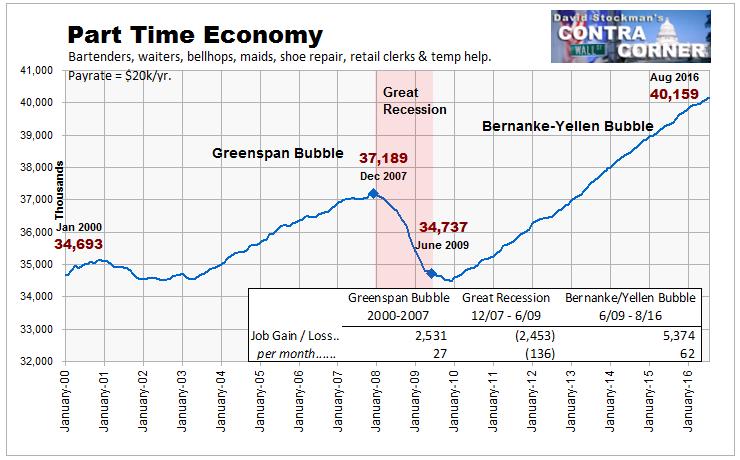 Yet, they all count as one job-one-vote on vote on bubble vision during the monthly ritual of Jobs Friday. Needless to say, they know better in Flyover America. Yet that’s not the half of it. The fact is, 2-3% annual inflation is not a lockstep affair. Nominal wage rates for import competing production and services jobs tend to rise slower than the CPI, meaning that the longer and more fully the Fed’s specious goal of 2% inflation is realized, the farther behind real wages become. In an excellent post today on the fraudulent median household income gain reported by the Census Bureau, Charles Hugh-Smith powerfully illustrated the point that only academics with their heads in the sand could believe that inflation is a benign vehicle of lock-step prosperity. Accordingly, among male wage earners since the 1970s, the top 5% have experienced a 51% gain in real wages—even using the BLS’ sawed-off inflation measuring stick—-compared to a 5% loss for the for the median earner. And that’s especially true for the overwhelming bulk of main street households where upwards of two-thirds of paychecks go to the four inflationary horseman of medical, housing, food and energy. 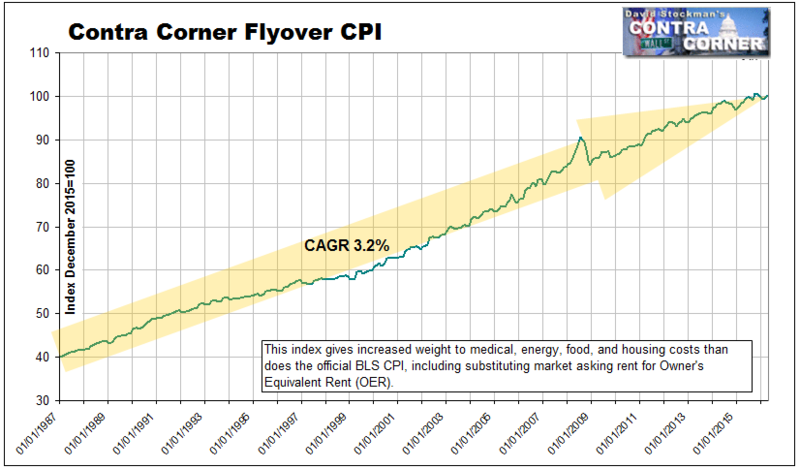 When you weight these true cost of living factors at 66% versus the BLS’ 55% weighting, and you use an accurate measure of medical and housing inflation, you end up not with “lowflation” as are monetary central planners so risibly claim. Actually, you end up with more than 3% per year inflation year-in-and-year out since 1987. Furthermore, when you then deflate the nominal median household income as reported by the Census Bureau by the Flyover CPI, you end up not with the spurious 5.2% gain so loudly ballyhooed by Washington and Wall Street last week. 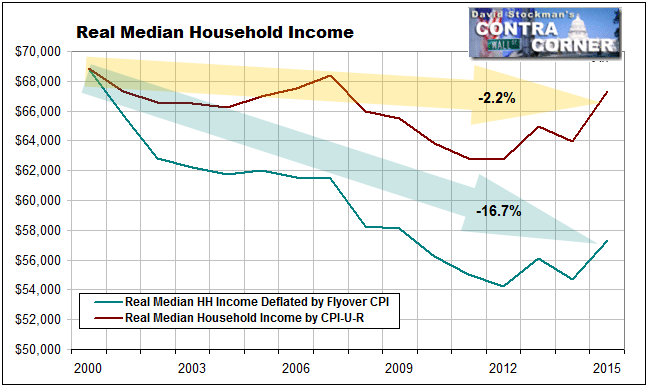 No, what you get is a 16.7% decline in the real median household incomes since the year 2000. That figure dramatically contrast with the 2.2% decline reported by the Census Bureau last week based on an inflation index (the CPI-U-RS) which seriously undercounts the true cost of living. Either way, however, the very idea that a posse of academic pettifoggers is attempting to spur more inflation should be reason enough for The Donald to go after the Fed with both barrels blasting during next week’s debate. It is bad enough, of course, that inflation targeting clobbers households in Flyover America as depicted above. What’s worse is that the resulting flood of central bank liquidity never leaves the canyons of Wall Street in today’s world of Peak Debt. Accordingly, the value of financial assets have been massively, systematically and relentlessly inflated. So doing, the central bankers bring about the ultimate affront to the struggling households of Flyover America. In a word, main street households have precious little discretionary income to salt away in “savings” and none that they can afford to put in harm’s way in the Wall Street casino. Indeed, the very idea that the policy of the state’s central banking branch is to force savers out of bank accounts and into so-called “risk assets” is beyond the pale. Yet a retiree who has been thrifty enough over a working lifetime to salt away $250,000 in a bank account is earning the equivalent of one Starbucks cappuccino per day in interest under the Fed’s 93 months and counting of ZIRP. In short, since the onset of Bubble Finance when Greenspan panicked in October 1987 and flooded Wall Street with cash and order to keep the insolvent banking houses of the day afloat the wealth creation process in America has been rigged in exactly the manner that the Donald has implied. Putting the wood to the Fed is the right answer for what ails the American economy. Monday night would be a good place for the Donald to line-up with the 90% who have been left behind. The GOP establishment which he defeated have already done more than enough for the top tier, even as it has helped populate the Fed with the Keynesians and beltway apparatchiks who have brought American capitalism to the brink of ruin.